Ever thought that your mobile phone would be a better thing if the company that built it focused as much on customer service as they did in packing out with features? If that’s you then it may be worth taking a peek at the new mobiles from British company Kazam. Its latest range includes the Tornado 348, which I have been playing with for a few weeks now. It does actually pack in plenty of features but uniquely comes with a customer service innovation that might be very useful to you if you have a habit of not working things out on your mobile. The new service, dubbed the Kazam Rescue, is kind of similar to the ones where external service people taken over your PC – after you have let them obviously – and tweak settings etc. With Kazam the idea is that if there’s something you can’t work out or need some help you can work with one of the team to sort it out. To do this you have to first dial up the Kazam number. Then the representative will ask you to click the Rescue button on your phone. After some checks on whether you are the phone owner you then are given the option of letting the rep take over your phone. Inevitably it works best if you have a good Wi-Fi connection, but it can still work over 3G or 4G too, it might just take time. You can see what is happening to your phone as the operative makes changes. Apparently most of the calls are to do with altering settings, for example finding networks etc. 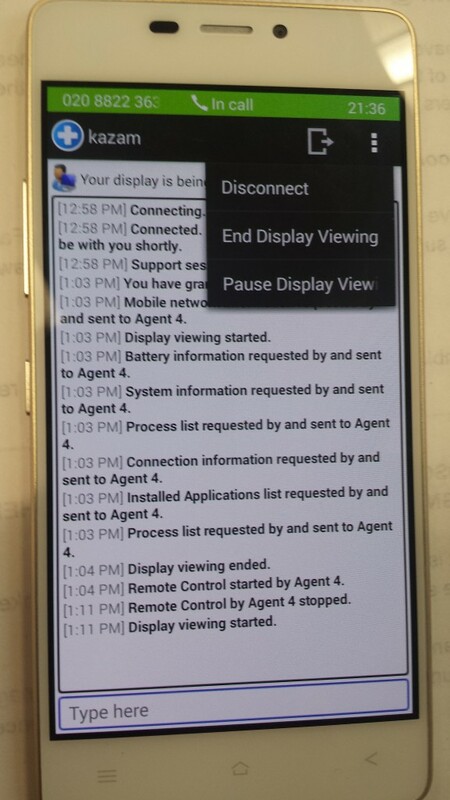 When I tested the service the call went pretty smoothly and tweaks were made to the handset almost instantaneously. I could clearly see what was going on as the representative was making the changes. It might not necessarily be the first thing on your mind when you buy a new phone but it is useful back up options if things go awry. Incidentally Kazam is also offering to replace your screen if it breaks within the first year. What of the phone itself then? The main thing that strikes you about is its thinness. The 348 is certainly one of the skinniest, if not the thinnest on the market. It is also pretty classy design. Ours was furnished in white and boasts a champagne gold metal strip. To be fair a bit like some other mobiles we could mention it does bend a little, though I think it would take a quite a lot of work to crack the screen, and as we have mentioned if you do apparently Kazam will sort you out. Speaking of which the screen, an AMOLED 4.8-inch display with a 1,280 x 720p resolution is really rather impressive. It is a slightly odd size too at 4.8inches which is tad larger than the 4.7inches boasted by the iPhone 6. Yet it excels displaying everything from video through to website with high levels of detail and rich colour. I was also knocked out by the camera too. Sure at eight mega pixels it is very much mid-range however the images it captured were pretty clear and smudge free. Low light conditions are dealt with admirably too. It is a bit lacking in manual options, but for this price that isn’t really unexpected. Lastly on the ‘what’s good’ list I’d add the fact that the phone boasts stock Android, which means it is clear from external apps, alternative interfaces etc. It doesn’t suit everyone but personally I love the way that it gives you plenty of customisable options. The biggest downside of the phone is its lack of 4G. Ok, so it retails for £250, but there are other 4G phones out there below that price point namely the Motorola Moto G. There’s also no LFC facility either which is less of a problem. Ultimately then this is a phone to consider if you like design are won over by its thinness and are prepared to compromise on the 4G. The customer service stuff is a useful benefit and that screen promise is a useful insurance give the thinness of the phone.